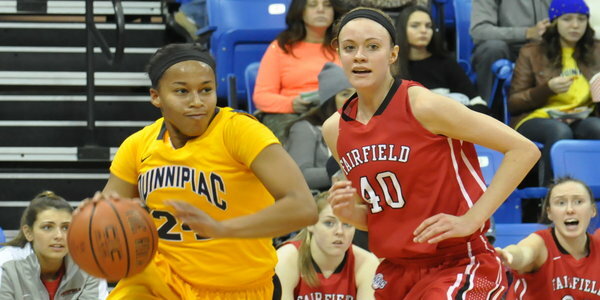 The Quinnipiac women’s basketball team couldn’t find consistent shooting all day, which ultimately led to a 61-52 loss to Fairfield Sunday afternoon at TD Bank Sports Center. The Bobcats didn’t have an answer for Fairfield’s Felicia DaCruz, who led the game in scoring with 19 points. She shot 50 percent from the field and helped open up shots for everyone around her. Quinnipiac never possessed a lead in the game as Fairfield took a 28-22 lead going into the half. It was a game that was managed by the Stags throughout both halves, which forced the Bobcats to play a defensive-minded game. Both Brittany McQuain and Boo Abshire found themselves in foul trouble early in the game, when Fabbri had to rely on her bench players to come in and play tough defense against Fairfield’s offensive surge. McQuain didn’t have the offensive game she was expecting after coming off an 18-point performance against Rider on Tuesday. Once she found herself in foul trouble she was never able to find a groove driving to the basket. Quinnipiac eventually cut the lead to four with just under two minutes to play but Fairfield’s Kristin Schatzlein put in a couple of open lane baskets to open up the lead as time dwindled. The Stags were able to maintain solid shooting in the second half, when they shot 42.3 percent as a team. Shooting 26 times from the line proved to be the difference as they had more free-scoring chances than Quinnipiac. The game started with a 10-0 run in Fairfield’s favor, which forced the Bobcats to adjust their game. The Bobcat’s fall into fourth place in the Metro Atlantic Athletic Conference after Sunday’s lost.